Mages were kings of the battlefield. Archmage’s mana had been depleted several times during the battle, but Xiao Yu had bought quite a few mana potions from the store beforehand. Although those mana potions didn’t replenish too much of mana, it was more than enough at the current stage of the archmage. His Cone of the Cold was able to drop icicles and kill groups of people. The Archmage was using the skill to kill enemies as if he was cutting a field of wheat. Although the strength of the icicles wasn’t enough to pierce through the heavy armor of the cavalry, it was very useful against the bandits. Xiao Yu and Tyrande stood next to archmage to prevent anyone from attacking him. While Xiao Yu’s level wasn’t high, being level 6 was enough him to use Ice Barrier and skills of the Blademaster to fend off most enemies. While Tyrande was specialized for long-range attacking, her white tiger could deal with four or five bandits without any problems. After adding a skill point to Beast Soul, her control over the white tiger and beast’s strength had both improved. Xiao Yu used the additional skill point from the level up to have the Archmage to master the elemental skill, Summon Water. It was another layer that the Archmage could use to protect himself. Blue light burst into the skill as a water elemental appeared by the archmage. It was about 1.70 meters tall. Water Elemental threw an icicle, killing the bandit that tried to climb over the wall. They were in bandits’ camp so the bandits were more familiar with the nearby terrain. In addition, some of them even moved ladders to try to climb the wall but the Water Elemental and archers killed them. Xiao Yu knew that there were many ways to deal with him had he tried to attack in the daytime, but the sudden night attack made the battle a chaos. The bandits had woken up all of a sudden to see that they were surrounded by flames and fires. That’s why only some of the bandits had gathered ladders while others didn’t. The vast majority of bandits didn’t know what to do but to bluntly attack. These bandits had wanted to rely on the mage, their warriors, and their heavy cavalry to deal with Xiao Yu’s forces. However, their hopes were crushed one by one. Their cavalry was decimated by riflemen and Glaive Throwers; their mage was killed by Tyrande; their warriors was suppressed by Tyrande and the Riflemen. As a result, they had no cards to take out. Bandits could only rely on numbers as their last resort. Their morale was falling to the bottom of the pit because of continuous frustration. Wars and battles were all about morale. If the morale of the soldiers went down and they lost the belief in victory then the eventual outcome was clear. Xiao Yu understood that the tide of the battle had tilted in his favor as he observed the battlefield from high ground. The bandits had made several moves to capture the wall but they couldn’t succeed. They fell out of formation. The grunts were born killers by nature. Footmen and riflemen gained their experience and knowledge about the Art of war through historical wars and battles. The grunts were born for chaotic battles such as the one happening in front of Xiao Yu. Human and elf warriors only had theoretical knowledge on how to react to such a chaotic battle. Moreover, more than half of the 200 grunts had reached level three. Their berserker skills were activated, increasing their attack strength by 50%. Although they were facing around 2,000 bandits, the grunts didn’t seem to have the phrase ‘give-up’ in their dictionary. The fight between Grom and Marcus had reached a new level. Marcus’s eyes were blood red as he was enraged and furious. How could he not be angry when years of his efforts were put into flames by a kid? He couldn’t wait to get Xiao Yu and slice him into pieces. However, he couldn’t pass by Grom however much he tried. Grom’s strength was on par with Marcus, but Marcus was a bit more powerful as a rank 2 warrior. Nevertheless, Grom was an orc with tenacious character. He used all of his skills to deal with Marcus. 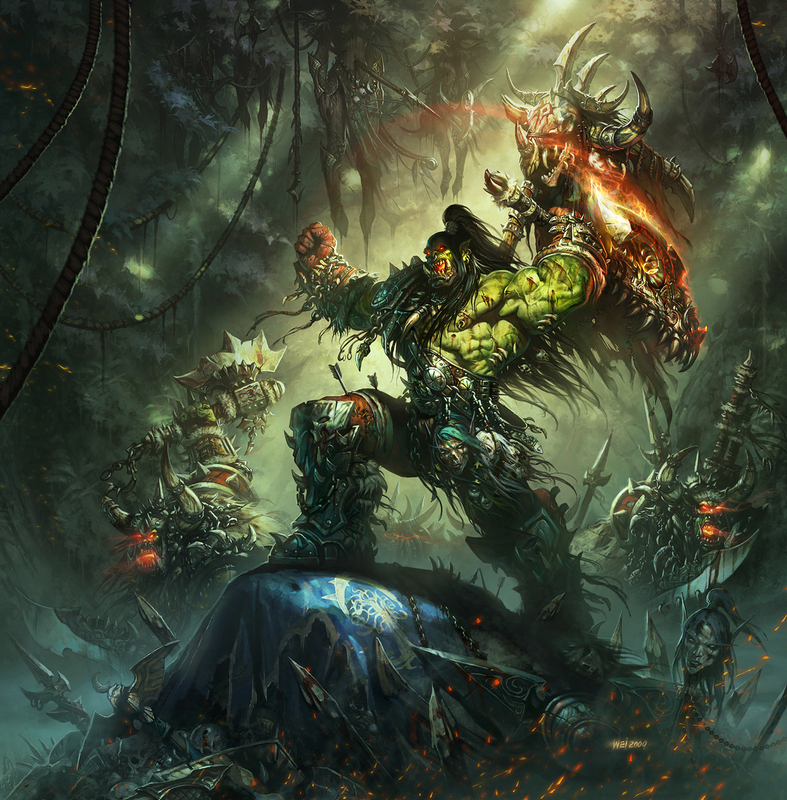 There were multiple injuries on Grom’s body, but the wounds only served to instigate the orc to enter a berserk state. Grom didn’t have a berserker skill but it was one of the hidden skills of orcs. A battle against someone who was far stronger than him had awoken this violent side of Grom. “Tyrande, try to harass Marcus but don’t kill him! Let Grom finish him off!” Xiao Yu understood that Grom was about to win but Marcus was still too strong. As a result, there was a stalemate. But if Tyrande supported Grom then there would be a chance to finish the fight soon. Xiao Yu knew that Marcus was a rank 2 warrior. If Grom killed him then he would reach level 10. This level was totally different from previous 9 levels. It was like the difference between heaven and earth. Level 10 was equivalent to a rank 2 warrior level, meaning that Grom would go through a qualitative change. It wasn’t just an increase in the overall attributes of the Blademaster; new skills would come with this level up. Tyrande was already ahead experience wise in comparison to Grom because she had killed many enemies using her rapid arrow shooting. She would level up anyway, but Grom had been involved in battle with Marcus since the start of the battle. That was the reason why Xiao Yu ordered her not to kill Marcus. Grom roared as he used Omnislash once again. At the same time, Tyrande used Searing Arrow to shoot an arrow towards Marcus’ throat. Marcus used his sword to first deflect the arrow then parry Grom’s attack afterward. Grom and Marcus’ battle energies collided and ended in an explosion. Grom finally prevailed over Marcus because of his height advantage. His sword quickly cut off through Marcus’s neck. In the next moment, Marcus’s head was tossed up in the air and separated from his body. “Awesome! Wonderful!” Xiao Yu jumped up in excitement. The battle was finished as Marcus had died. Two golden light burst out and wrapped around Tyrande and Grom. Both of them had reached level 10. Trueshot Aura (up to level 5). The user and team mates gain a 20% enhancement on long-range attacks strength with each level. Up to a 100% increase. Aspect of the Hawk (up to level 3). The user summons an eagle soul guardian. The eagle soul will be integrated with arrows shot by the user. It can be used once every 9 arrows shot. The skill can be used on a maximum of 3 arrows out of every 9 with level ups. Rapid Fire (up to level 3). The user will increase the rapidity of shots fired by 30%. This skill has a cooling time of 10 seconds. The maximum speed increase will reach 100% by the last level. Whirlwind (up to level 3). The user rapidly rotates the held weapon. Strong damage will be dealt to nearby enemies. There will be 50% damage increase in level 1, 100% on level 2 and 150% on level 3. Heroic leap (up to level 3). On level 1 the user can jump a distance of over twenty meters and to a height of 3 meters. On level 2 the user can jump a maximum distance of 50 meters and to a height of 5 meters. One level 3 the user can jump a maximum distance of 80 meters and to a height of 10 meters. Intimidating Shout (up to level 3). The user issues a strong roar that reduces the morale of enemy troops by 10%. The maximum level of reduction is 30% on level 3. The effect is determined according to scope and distance. If the enemy is higher leveled than the Blademaster then the effect is weakened. Sprint (up to level 2). The user will rapidly dash forward 20 meters while damaging nearby personnel with his weapon. The user can sprint up to a maximum of 40 meters on level 2. Xiao Yu was in excitement as he checked out all the new skills. He looked like a madman. The new skills were too awesome! Moreover, he could master those skills too! “Tyrande, learn Trueshot Aura, Grom, learn Whirlwind.” Xiao Yu knew that he was fighting a largely defensive battle where group skills would be the most practical. “Bandits! Your leader is killed! There is no point in resistance. If you continue to fight I will cut you all in half. Do you surrender?” Xiao Yu loudly shouted when he saw that the morale of the enemy had collapsed. Some had seen Marcus beheaded by Grom. However, most weren’t aware of this because of the chaos. Grom threw Marcus’s head onto the wall. Xiao Yu caught it and held it up high to show it the bandits. The bandits couldn’t withstand the teamwork of the grunts and archers. It was a matter of time before all of them would be annihilated. Now, they saw their leader dead so most knelt down to surrender. However, many grunts had entered their berserk state and didn’t know when to stop. They went on with their massacre. “All of you stop!” Xiao Yu loudly shouted. The shortcoming of grunts was that they couldn’t stop once they entered the berserk state. Fortunately, all of them were summoned by Xiao Yu and were forced to be absolutely obedient to Xiao Yu. They slowly stopped after hearing his voice. However, had they been orcs from the real world then nothing could have brought them back to sanity once their eyes turned red. Humans were aware of this orcs’ condition, so they typically used traps to kill them once orcs entered their berserk state. The grunts were restrained. There were about 800 bandits left alive out of the original 5,000. Xiao Yu had killed more than 4000 bandits. It was a total victory! I think Jaina will be a fire magician. The skills of Antonidas are Jaina’s. Grom seems to be fused with Illidan. He uses knives and his abilities, while maintaining the great body he originally has.